A three-month closure order has been secured at an address in Bedford due to anti social behaviour. The order was carried out by Bedfordshire’s North Community Policing team following a hearing at Luton Magistrate’s Court earlier today (Tuesday). 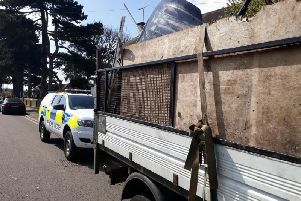 Officers served the property in Upton Court with a closure notice yesterday (Monday) following a number of reports of on-going anti-social behaviour at the property. The team worked closely with their partners at bpha and the Bedford Borough Community Safety Team to resolve the issue. The application has been accepted by the court and a three-month closure order has been put on the address to prevent the future offending. PC Sharon Cummings, from the North Community Policing team, said: “We are continuing to work closely with the council and with partner agencies to protect our communities and improve Bedford’s neighbourhoods. You can report suspicious behaviour online through the force’s reporting centre or by calling 101.